Note: Women with disabilities are statistically less likely to get mammograms than women without disabilities and are three times more likely to die from breast cancer. March 14, 2016 – The settlement follows an investigation into allegations of discrimination for failure to accommodate patients with disabilities. As part of the settlement agreement, the NYC Commission on Human Rights is requiring Lenox Hill Radiology to modify the front and interior of its building at 61 East 77th Street, Manhattan, to make it accessible to people with disabilities; provide equipment in line with the U.S. Access Board’s accessibility standards to ensure that mammography machines are accessible; change internal scheduling, communications, and equipment purchasing policies citywide; and train staff at all its New York City locations to better accommodate patients with disabilities. The Commission initiated an investigation into Lenox Hill Radiology after it received a letter from New York Lawyers for the Public Interest identifying accessibility issues at Lenox Hill Radiology’s 77th Street location. The Commission then tested and visited the facility and verified the claims. Lenox Hill Radiology, which fully cooperated with the Commission’s investigation and settlement process, is currently making the agreed upon changes and the Commission is working to ensure that other Lenox Hill Radiology facilities in New York City are accessible to people with disabilities. The U.S. Access Board issued accessibility standards for medical diagnostic equipment in January, 2017, that provide design criteria to ensure that medical and diagnostic equipment, including mammography machines, are accessible to people with disabilities. Although the U.S. Access Board has authority to issue standards, the standards do not become mandatory until an enforcing authority, such as the NYC Commission on Human Rights, requires entities to adopt them. The New York Lawyers for the Public Interest’s letter to the Commission noted possible violations and described the experience of Susan Scheer, a long-time disability rights activist who experienced great difficulty when attempting to get a mammogram at Lenox Hill Radiology’s main office at 61 East 77th Street in Manhattan. Scheer, who requires the use of a wheelchair, went in for a mammogram, was forced to change in an open, non-private room where the radiology equipment was located because the private changing room was too small to accommodate her wheelchair. Scheer also experienced extreme pain and humiliation during the examination due to the lack of accessibility of their mammography machine, in addition to the typical discomfort of getting a mammogram. Because the mammography machine would not lower far enough, Scheer was forced to contort herself into a painful position and was asked to stand on one leg during the exam, which due to her disability, caused her extreme pain and discomfort that lasted for days afterward. Ultimately, despite her suffering, Scheer believed her exam images were inaccurate because she could not contort herself into the requested position. Staff were also unable to direct Scheer to an accessible Lenox Hill Radiology facility when she followed to make another appointment. The Commission found several violations of the NYC Human Rights Law disability protections during its investigation of Lenox Hill Radiology, which the Commission is requiring Lenox Hill Radiology to fix in a settlement agreement. It is illegal in New York City for employers, housing providers, and places of public accommodation, including doctors’ offices and hospitals, to discriminate against people with disabilities by denying them access to employment, housing, and goods and services or by denying them reasonable accommodations. Create and conduct a scheduling training and disability awareness training for all Lenox Hill Radiology staff citywide to educate them on how to accommodate and work with patients with disabilities. According to estimates, 1 in 8 women will develop breast cancer in her lifetime. Although women with disabilities have the same incidences of breast cancer as women without disabilities, they are statistically less likely to get a mammogram and are three times as likely to die from breast cancer, studies show. According to the Center for Disease Control, only 61 percent of women with a disability aged 50 to 74 have had a mammogram in the past two years compared to 75 percent of women without a disability. Currently, 1 in 8 New Yorkers (or 1 million people) are living with a disability according to the Mayor’s Office for People with Disabilities. Access to buildings and services can be a life or death situation for people with disabilities in New York City. That is why the NYC Commission on Human Rights intervenes early when it learns of alleged acts of discrimination based on disability. 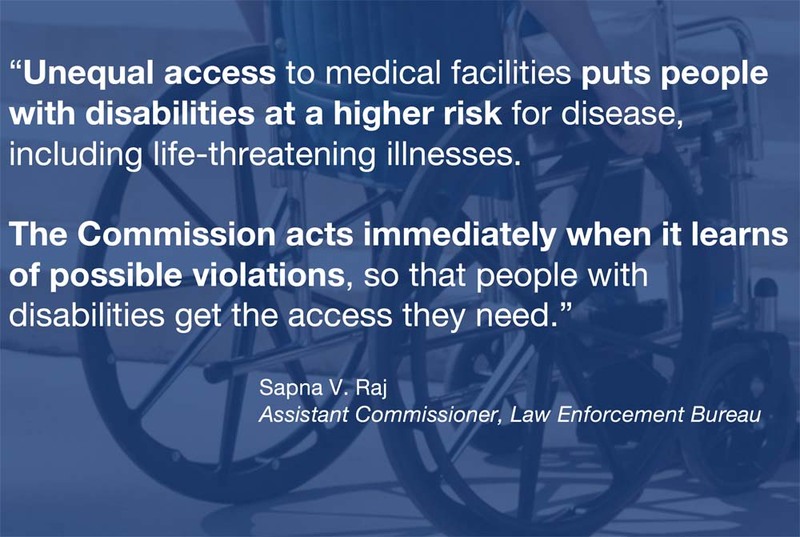 The Commission’s Project Equal Access works with businesses, housing providers, and public accommodations to make facilities accessible to people with disabilities before the matter becomes a legal matter, including installing ramps, renovating bathrooms and other areas to make them accessible, installing electronic doors, grab bars and handrails, and training staff on how to accommodate people with disabilities. In New York City, entities are required to make reasonable accommodations for people with disabilities unless the accommodation causes them an undue hardship. In 2017, the Commission negotiated 216 pre-enforcement modifications on behalf of people with disabilities. If an entity is unwilling to make a reasonable accommodation, the Commission takes enforcement action to ensure compliance with the NYC Human Rights Law. Over the last two years, the Commission increased its investigations into disability discrimination by 20 percent, filing 547 new investigations. In 2017, disability discrimination was the largest area of complaint at the Commission. People who believes they are the victim of disability discrimination, including being denied access to buildings or programs or denied a reasonable accommodation, should call 311 and ask for NYC Commission on Human Rights or call the Commission’s Infoline at 718-722-3131. Reports may also be filed anonymously. People may also report discrimination on the Commission’s website.